Why it matters: Enterprise-grade hardware is often far too expensive for consumers, but advances made in storage density and performance can make their way into more affordable components over time. Samsung's latest SSD breaks records for storage density and offers many benefits to data center customers. 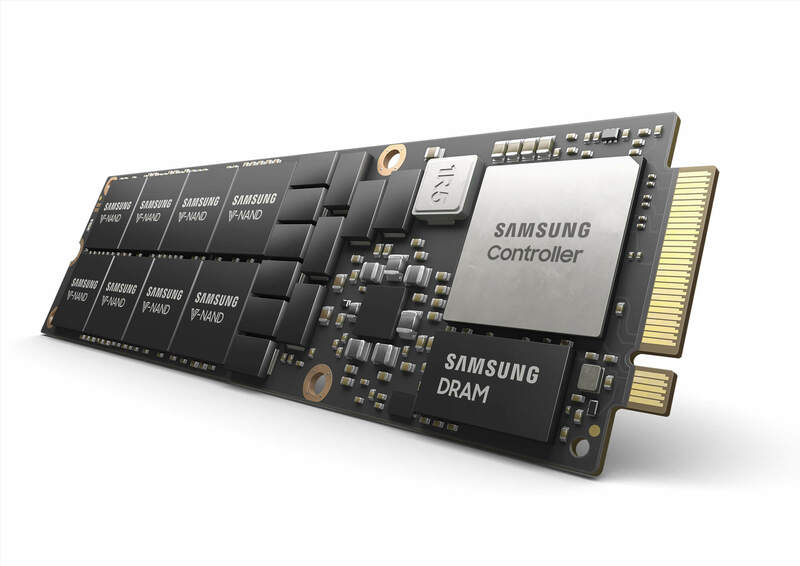 Samsung Electronics has launched the largest capacity NVMe solid state drive to date. The 8TB NF1 SSD will target data-focused analytics and virtualization requirements within data centers. Even though this SSD is going to be fast and have a high capacity, its unique feature is being physically small. Otherwise known as Next-generation Small Form Factor (NGSFF), NF1 is a minuscule form factor measuring in at 11cm by 3.05cm that allows for three times the storage density of M.2. Samsung's new SSD runs on 16 pieces of 512GB NAND. Each chip has 16 layers of 256 gigabit V-NAND with 3-bits per cell. This increase in capacity allows for up to 576TB of storage to be put into 2U rack servers. In terms of performance, the 8TB SSD runs on the NVMe 1.3 protocol and has support for PCIe 4.0. Sequential read speeds approach 3,100 MB/s while write speeds are around 2,000 MB/s. Random reads are rated at 500,000 IOPS with random writes rated at 50,000 IOPS. In order to handle data-intensive tasks, 12GB of LPDDR4 DRAM is used as temporary cache space. As with any application requiring mass numbers of read and write operations, durability is rightfully a concern. Samsung believes this drive will have no problem handling extremely demanding tasks and states that this SSD can withstand 1.3 drive writes per day, equating to more than 10TB of writes daily for the three year warranty period. In the second half of this year, Samsung is planning to launch another similar SSD utilizing 512 gigabit V-NAND cells instead of the current 256 gigabit chips.